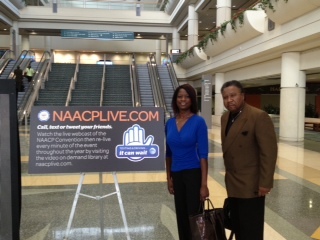 For two years the NAACP has denied a request by conservative author Deneen Borelli to speak at their annual conference. When Borelli, who is an employee of the conservative group FreedomWorks, attempted to pay for booth space at last year's National NAACP conference in Florida, they were told there was no room for them despite plenty of exhibit space remaining open. Borelli plans to sponsor an event in the same hotel during the NAACP's annual convention in Las Vegas next week. FreedomWorks’s Empower.org Liberty Summit event will be held on Monday, July 21 from 2pm to 5pm at the Mandalay Bay Hotel. "I will moderate the event and will focus on how Obama's war on coal is preferentially harming the black community where unemployment is double that of white Americans and have the lowest average incomes," Borelli said. "We plan on focusing on 3 topics for the Empower Liberty Summit: Education, Employment, Energy. We also have a table in the exhibit hall."